Case Study. 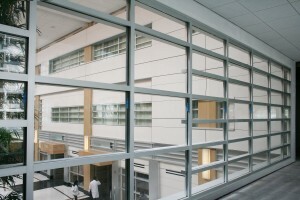 Medical Center Maximizes Natural Daylight with Fire Rated Glass. 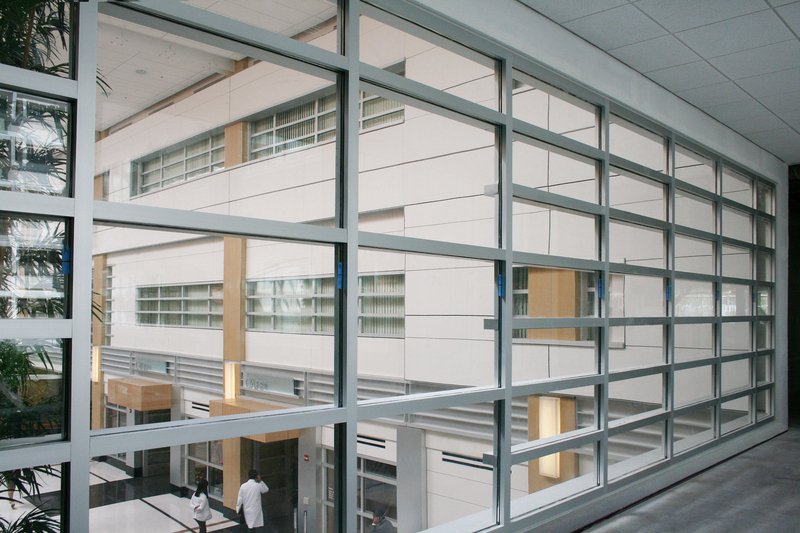 The new UC Davis Medical Center allows natural light to vertically flow into the atrium area and other light wells using over 20,000 square feet of fire resistive glazing and framing. 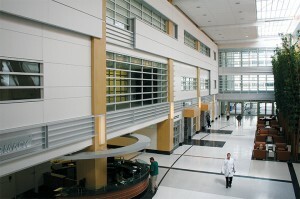 This new three-story above, and one story below grade, 470,000-square-foot medical facility is a result of a dual effort to expand an aged, undersized facility and to comply with Senate Bill 1953, which requires hospitals that have Structural Performance Category 1 (SPC-1) buildings (those that are considered hazardous and at risk of collapse or significant loss of life in the event of an earthquake) must be replaced or retrofitted to higher seismic safety standards by 2013. Central to their design was a large skylight that allows natural light to vertically flow into the atrium area and other light wells throughout the building. However, they also wanted to let light flow horizontally into the adjacent hallways, rooms, etc. Because the walls in the atrium and light wells have to meet a 2-hour rating, Stantec Architects approached SAFTI FIRST for a solution. To maximize as much natural light as possible, large portions of the 2-hour atrium and light well walls were made “transparent” with the use of SuperLite II-XL 120 in GPX Framing by SAFTI FIRST. In addition, the doors were made with SuperLite II-XL 90 in GPX Framing by SAFTI FIRST to match the transparency of the walls. This way, the architect was able to keep his design while still meeting the fire and safety requirements of the code. Using fire rated glass instead of opaque fire rated materials such gypsum and brick walls played a major role in achieving that. The architect also wanted to make sure that the fire rated systems match the look of the non-fire rated systems in the exterior. SAFTI FIRST made this possible by making sure that the GPX Framing used in the interior fire rated systems had the same profile and clear anodized finish as the exterior non-fire rated systems. In addition, the patient waiting rooms also had a lot of fire rated glass to provide a feeling of openness and help ease anxieties as patients wait to be seen. Full vision 90 min. double egress doors were also provided in the triage area. Also interesting is the fire rated art glass for the Prayer/Reflection area. By using SuperLite II-XL 60 with Decorative Art Glass in GPX Framing, the architect was still able to keep the artistic vision that he had for this space and still meet the fire rated requirements. SAFTI FIRST also worked closely with Best Roofing and Contracting, the glazing contractor, to make sure that the installation and delivery of the materials went smoothly. Jeremy Henderson, SAFTI FIRST’s GPX supervisor, also visited the job site several times to demonstrate how the system is installed and to answer any questions that they may have. At the end of the day, SAFTI FIRST was able to deliver over 20,000 square feet of fire resistive glazing and framing for this project, one of the largest and most ambitious installations of fire resistive glazing systems in North America to date.